The classic Portaflex cabinet is back with a modern twist. The Ampeg PF115HE Portaflex bass cab is modeled after the original B15, but has upgraded components. An Eminence 15" speaker and a defeatable 1" tweeter provide the big, bottom-end tone that Ampeg is known for. The top comes off so that you can attach any of the new Portaflex series bass heads to it in true flip-top style. Adding the head makes this a great all-in-one combo that protects the electronics between gigs. The big tone of the 15" speaker will fill the room gig after gig. 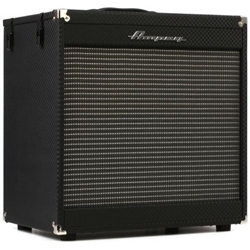 Bring a classic look and sound to your bass rig with the Ampeg PF115HE Portaflex bass cab.